I want to thank everyone that wrote and told me how wonderful my video on puppy biting was. Seems I wasn't as bad as I thought! So thanks for supporting me and my video experiment. I just wanted to let you know that I will be away Friday-Sunday at a seminar. I won't have time to return phone calls or emails but I promise I'll get on it first thing Monday. What's with the horse videos? My niece is looking to a buy a new horse and it just so happens that the place she's looking at, that sells Canadian horses, is just a 1/2 hour from me. And she lives 8 hours by plane away from here. I told her I'd go look at a few horses for her and send her the videos. It was just easier to put them up on YT than to email them all. So that's what's with the horse videos! Off to teach my class at the college! Hope you're having a good day! My email has been giving me problems the last 2.5 days. The server is full but I can't figure out how to take the old messages off. For now, I've increased my data to unlimited so it's back up and working. I can only imagine the price that will be! Unfortunately I can't contact the support team by phone, only by email. Which didn't help me because I couldn't get email!!! Good grief. Anyways, for those of you who emailed me and didn't receive an answer, that's why. Please email again and I promise to get back to you ASAP. I had a concern from a new puppy owner that his puppy wasn't eating very much. The pups are going to take up to two weeks to adjust to their new surroundings. It will probably be much faster than that but you need to give them lots of time. I have been adding hot water to the pup's meals about 10 minutes before giving it to them. They seem to enjoy it a lot better. So give that a try and I'm sure your pup will eat a lot more. Meet "Baloo"aka Mr. Red! He looks quite content with his new playmate Mr. Bear. In reality, he has a bigger friend who's name is "Ursus". I think Ursus & Baloo will be best friends! I've put up a video about how to discourage puppy biting. It's just me, talking to the camera. It was an experiment. My conclusion was, I won't be doing that again! It took about 6 takes and it's really boring to watch! That's what experiments are for I guess! The idea was to start making short clips to help people with their day to day lives with their k9 partners. If I'm going to do that, it's going to have to be a whole lot more interesting! Practice makes perfect I guess! Please send suggestions and comments! New puppy videos being uploaded to You Tube right now! My channel is "k9trainergsd" Subscribe so you won't miss anything! With the puppies going home, I'm getting lots of questions about crate training. Most people are "for" crate training but there are a few that are defintely against! As I was typing this, I noticed I had only one dog at my feet instead of three. I snuck into the crate area and snapped this picture. You'll notice that right outside his crate is a soft cedar bed. Instead he chose to sleep inside the crate with the door open. It gives them the feeling of security, not imprisonment. I'm not going to spend a lot of time trying to get people to change their mind. What I am going to do is list all the positives about crates. The people who are against crates seem to think of them as cages. That is extremely far from the truth. Dogs think of them more like dens! l. Housebreaking - an invaluable tool when the pup has to be left alone for a few hours. Dogs will rarely soil their beds. 2. Prevents chewing - supply your dog with a stuffed chew toy or equivalent while in his crate and you know that is all that will be devoured when you come back. Not your couch. 3. Safe transportation - a crate keeps your dog where he belongs in your vehicle. Safe for you and him. It also keeps most of the hair off the seats (which he won't be chewing). It also prevents him from jumping into the front seat unexpectedly possibly cause an accident. 4. Hotels - if you plan on taking your pet on holidays with you often hotels will accept dogs in crates but will not accept others. Think of the damage one dog could do in a strange, unoccupied hotel room while you are out for dinner. 5. Air travel - if you need to take you dog on an airplane (holidays, moving, breeding, shows) think how much happier he'll be in his familiar bed. 6. Confinement - if necessary to restrict movement for veterinary purposes (eg. to allow a fracture to heal). He is already used to his crate and won't fret. Your puppy has been introduce to sleeping in a crate from the time he was 5 weeks old. The only difference between your house and mine, is your pup is alone in the crate. He had littermates here. I suggest introducing your puppy to a stuffed chew toy (e.g. kong) outside of the crate. Make sure it is an especially good treat he's trying for. Once he really catches on, show him the toy, throw it in the crate, and shut the door. With your puppy on the OUTSIDE. When he starts whining and digging at the door to get his treat, let him in. Close the door behind him but stay near him. After 20-30 seconds of him chewing his treat, open the door and take away the chew toy and let him come out. Do this 2 or 3 times, then take the toy away for practice at a later time. Each time you practice, give the puppy longer and longer to chew the toy inside the crate. Pretty soon he will associate the crate with something incredibly delicious! Save that favourite chew toy for times when you must contain him in the crate. Pretty soon he'll be wishing you'd go somewhere so he can go in his crate! New videos posted to You Tube! 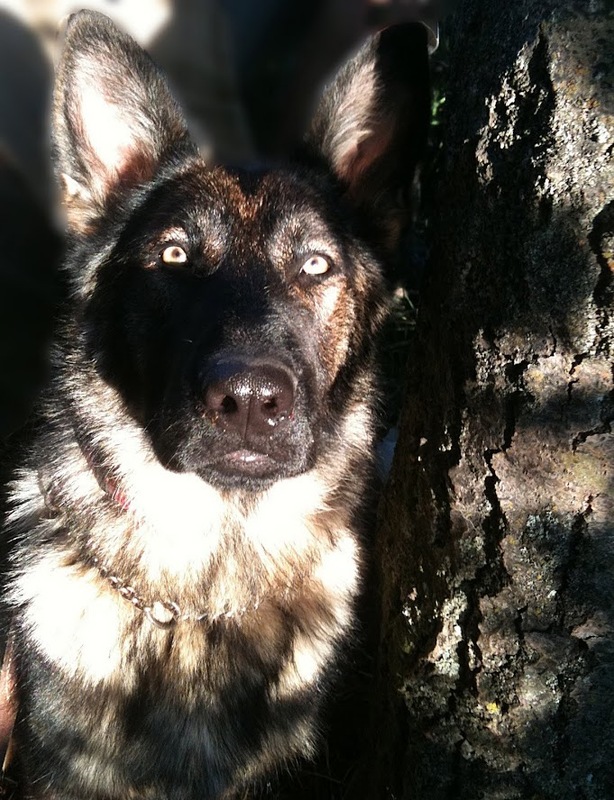 Search You Tube for "k9trainergsd" for my channel! Mr. Blue "I'm outta here!" Things to bring when you pick up your puppy. 1. A clean up bag for the car, which includes paper towels, a garbage bag, a towel or blanket and a moisture barrier (eg. garbage bag) to put on your lap. Your puppy WILL get car sick. Be prepared! 2. A blanket that we can rub on Indy and the other littermates. This should be put in with the puppy at bedtime so he/she doesn't feel quite so alone. 3. Three names. The name you want to call your puppy and two back up names. This is for registration purposes. It's possible that the name you picked has already been registered to another dog so the CKC will use your next favourite, or possibly, your next favourite. This has no bearing on what you call your dog on a day to day basis. E.g. Merlin's registered name is CCK9 Lucky. The first pup has gone off to her new home. 8-( I'm always sad, and almost always cry once they're gone. I know they are going to a wonderful home but it's still hard to say goodbye. Everybody has to promise they will send updates and lots of pictures!! I LOVE getting pictures of my babies! Miss White has her ears up! Oh my gosh! This is the cutest thing! Check it out! It's not just footage of Miss White; I think I have a little bit of everybody. Enjoy! Poor puppies had a tough day. Not only were they poked once, but twice! I feel badly for the poor little guys but it's in their best interest. The microchips are registered to the new owners and provides a lifetime recovery system. The chips can be read throughout North America so even if your dog gets lost while on vacation in the States, they will still be able to locate the owner. But it's up to the owner to remember to update the information. If you move, or change your phone number, they won't be able to contact you. As long as you remember to keep things current, your dog will find it's way home! That's what saved Goliath's life. The microship was traced back to my kennel and I was able to save him from euthanasia. He's such a sweet boy. It would have been a horrific mistake to have him killed. The poor guy was just scared half to death. I'd growl in those circumstanes too! He doesn't have a mean bone in his body. He's just a 110 pound couch potato! Nobody told him he's not a lap dog! So the pups have had their shots and been microchipped. One chip actually broke while it was being implanted so I'll have to get another one. But that pup isn't going home for a few weeks so I have lots of time to get a new one. I've never seen one break before. I didn't even know it was possible. I guess you learn something new every day. Turns out Indy was allergic to something new they put in the Royal Canin Large breed puppy food. I've had to take them all off the Royal Canin and have transferred them over to Acana Large breed puppy. If you've already bought Royal Canin, don't worry. I'd prefer them to be on the Royal Canin so you can transfer them over when you get down on the Acana. So, they will all need ACANA LARGE BREED PUPPY to start. I leave it up to you whether you want to change them over to Royal Canin or another brand that you like. Here's the best matches for both people and puppy! I have gone over these picks many, many times. I know some of you where hoping for a different pup than I have chosen for you but the best match is what I have provided for you. Congratulations everyone! You have just found your perfect K9 partner!! PS. Please make an appointment with me for pick up if you have not already. The pups can go home as of March 16th. All pups must be paid for in full before leaving either via email money transfer or certified cheque or money order. The puppy aptitude test was developed by Jack & Wendy Volhard in 2001. It helps determine the puppy's strengths and weaknesses. Yes, weaknesses. Although we all want the perfect puppy, it very seldom happens. Most times you need to be able to give up something to get something. If you want a male, black and tan, medium energy, highly social, guard type dog, you're not alone! There might be one of those in a litter but there might not be. Maybe it describes one pup to a tee but it's a female. Or maybe it's black. Or maybe it's highly social but you have to give up some of the guard traits. Sure it will stand and bark but maybe she won't bite. "Guard" means different things to different people. So yesterday was the puppy aptitude test. There was a few minor surprises but it pretty much went the way I thought it would. I know my Alpha, my social butterfly and my pouter. It wasn't a surprise. It will take me a few days to interpret the results and match up the people. This is a very stressful time for me. I need to determine priorities of traits because as I said above, most times you have to give up something for something else. What? Did you say something? Aw come on man! I'm trying to sleep! I think if I'm reincarnated as a dog, I'd like to come back as a Guardian Angel Shepherd! It's a tough life but someone has to do it! This is Isis catching a few zzzz's in between babysitting the puppies. Just TRY and wash the floor! We dare you!